Keep your tea warm with a snug little tea cozy to cover your teapot. No matter what season you happen to find yourself in, a simple crochet tea cozy will enhance your decor and brighten even the gloomiest day. 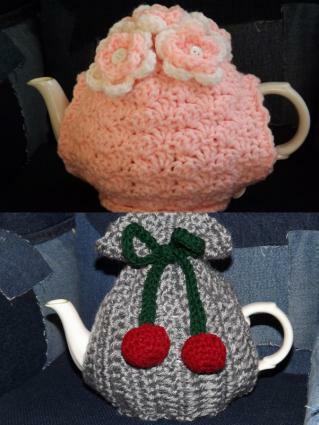 The teapot used in these patterns is round and holds 3-4 cups of tea, but both of these tea cozies were made with customized instructions that will fit your teapot's individual size and shape. Each pattern can be completed by a beginner crocheter and in most cases can be finished in one or two evenings. Click on the desired photo to download and print the instructions. You can find additional help with downloading the patterns by using this handy guide. Done in soft pink and white, this tea cozy is a wonderful accessory for a spring tea party or a break in the garden with a good book. The texture of the shell stitches and the crocheted posies displayed on top give the cozy a romantic look. 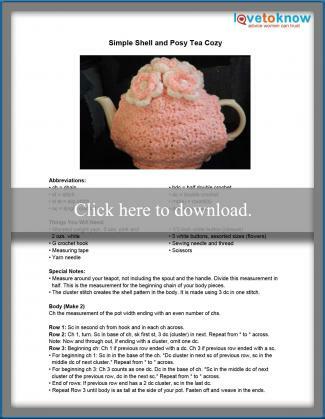 The title of this crochet cozy implies the teapot is inside a bag. While that may be true, there is no bottom to the bag. Made using two strands of yarn, this tea cozy comes together very quickly. If you need to adjust the size or appearance of your crocheted cozy, try some of these suggestions. Thinner or bulkier yarn can be used on either pattern. The customized instructions ensure a perfect fit. Yarn colors are, of course, a personal preference. Choose colors that match your own style or home decor. For tall teapots, adjust and make a beginning chain at least two inches taller than the pot for the drawstring bag cozy. Silk flowers can be substituted for the crocheted posies. Simply stitch or glue them to the top of the cozy. Large wooden beads can be substituted for the crocheted cherries. Add a bit of hot glue in the holes and insert the drawstring ends. 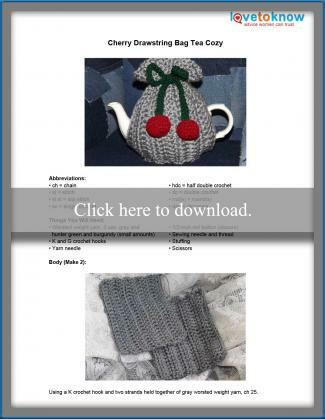 Why Didn't Anyone Tell Me is sharing the tea cozy love with this beautiful crochet pattern. It works up snug with beautiful full-size crochet roses attached to the top. This is an easy pattern, perfect for a new crocheter with a firm grasp of simple crochet stitches. The daisy teapot cozy pattern on FaveCrafts has a pretty striped design created using cotton yarn. This is another easy pattern that can be stitched up very quickly. The Adventures of the Gingerbread Lady has come up with a unique way to customize a fit for your teapot. She starts at the top and works her way down the sides. The picture tutorial is done in stripes, but keep scrolling down the page for additional options using the same pattern. This pattern is suitable for a beginner to crochet. Curl up in a comfy chair with a pot of tea by your side and stitch up a couple more cozies for friends and family. They make thoughtful and functional gifts for all the tea drinkers in your life.